Meteor House is pleased to offer three special preorder package deals for the Signed Limited Edition hardcover of The Scarlet Jaguar by Win Scott Eckert, now through the end of October (or while supplies last). PACKAGE #1: Save $5 plus even more with the combined shipping discount! 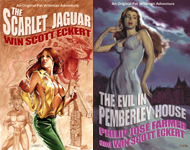 Purchase The Scarlet Jaguar with The Evil in Pemberley House by Philip José Farmer and Win Scott Eckert — both Pat Wildman adventures! PACKAGE #2: Save $5 plus even more with the combined shipping discount! 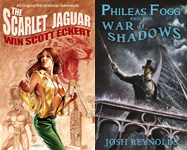 Purchase The Scarlet Jaguar with Phileas Fogg and the War of Shadows by Josh Reynolds. With less than 20 copies remaining of the Hardcover Limited Edition of Phileas Fogg and the War of Shadows, this offer is only good while supplies last! PACKAGE #3: Save $10 plus even more with the combined shipping discount! 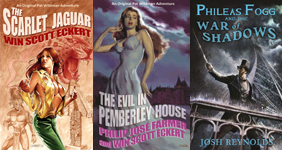 Purchase The Scarlet Jaguar and The Evil in Pemberley House and Phileas Fogg and the War of Shadows. One Mega-deal for all three books. Again, only while supplies last! If you have already preordered The Scarlet Jaguar and would like to take advantage of one of these packages, just contact us at sales @ meteorhousepress.com and we’ll send you an invoice for the difference.